Our family lives firmly by the motto that you can never have too many books, just not enough time to read them in. (Use this Barnes and Noble coupon code to start building your own library). We have now also reached the stage whereby it isn’t just an issue of time, but also bookshelves, general storage space (Mike has even put up shelves in the loft), and facing up to the realisation that you have visited the local branch of ‘The Works’ so many times that you have their personal numbers on your mobile phone in case you need to call or text over a book order, and that’s just not normal. I’m not even kidding. As a child, I was a voracious reader. With a mother that didn’t want me around more than she felt she needed to put up with me, and with a very large age gap between me and my only sibling, I spent a lot of time in my room with a book. I believe that books, like songs, invoke memories. One book I distinctly remember was the only book my mother had owned but one I had never seen her read. It was a light brown hardback with bold black lettering on the spine. I can’t quite remember the title but recall it had characters by the name of Priestley and his friends who had gardeners and staff and threw dinner parties. The book was made up of several hundred pages which set out various scenarios of Priestley et al, in an attempt to explain the rules and grammar of the English language. An odd choice of reading for a little child who lined up her teddies so that she could read to them as if she were appearing on television Jackanory-style indeed, but one which undoubtedly helped me to learn the language that wasn’t my first or even my second, a language I didn’t begin speaking until I was 3-years-old. Other books I loved were Nina Bawden’s The Peppermint Pig, which made me cry every single time I ever read it – and I read it a lot. Another was the story of Heidi, which left me imagining my bed was tucked away high up in a hay loft, with a tiny window beside it that overlooked fields speckled with goats that grazed under clear night skies as the stars twinkled away by my window. My mum never read to us as children. My dad would do so occasionally, making it fun with amusing character voices and exaggerated narration, but he was more of a improvisatory storyteller. His forte lay in telling a story and telling it well and humourously, but spontaneously. There was no such thing as a bedtime story for us, unless we read it ourselves. When my children were born, encouraging a love of books was not something I consciously made a decision to do. It was a natural development borne of my own inability to pass a book by without skimming it, reading it, buying it or immersing myself into it. As a result, my two oldest children, despite having very little else when they were young, always had a supply of books accessible to them. I read to them from the time they were born. We would make theatres out of cereal boxes and old clothes and create puppet shows that would bring characters to life. And there were always bedtime stories. The Book Trust launches its Bath, Book, Bed campaign this week in an effort to help knackered parents settle their children more easily. The theory that Supernanny Jo Frost and Daddy Pig of Peppa Pig fame have teamed together to provide, is that a warm, relaxing bath, followed by a peaceful bedtime story or two will result in your little one nestling into their duvet cocoons and heading off to the land of nod without a peep. I guess it does make better sense to have the gradual wind-down at the end of the day rather than a sudden change from high-stimulation and activity to expecting them to fall into a contented, happy slumber. I am sure this works for many parents, and if it does for you, I doff my virtual hat to you. Personally, I don’t remember my older children ever being fooled by this routine. I did, however, find them getting up to mischief after they had been tucked up on several occasions. Other times, I found them being complete devils when they should have been asleep. Like the time they poured bucket after bucket of water over their bedroom carpet. The reason that Stephanie gave me was that the carpet was blue and they wanted to make it into the sea. Ben reassured me that it was all Steph’s idea and all Steph’s fault and nothing to do with him. As the family grew, so did our collection of books. But the logistics of the ever-growing family needed to be constantly adapted and adjusted. As the young children became the older children and more children joined our family, the bath, book and bed routine that the older ones had known soon become forgotten. Bathing so many children is a time-consuming effort in itself, especially at the time when we had six children under seven. I have often considered creating a sheep-dip contraption that deals with the process of bathing several young children as bathtimes were very much a case of one in… one out… next one in… It still is, although the number of children I’m having to carry this process out with is finally decreasing thanks to them moving into the stage of self-hygiene or, to put it more accurately, soap-dodging and claiming they’ve bathed or showered when they haven’t. Having so many people in one house and only two bathrooms also means we need to make use of the rooms when we are able to. This, along with trying to fit everything around everyone’s commitments, timetables, clubs and general to-ings and fro-ings, means that showers and baths are taken throughout the day rather than just limited to evenings. Generally now, I find it easier and more practical to bath the younger children earlier in the day than the evenings. 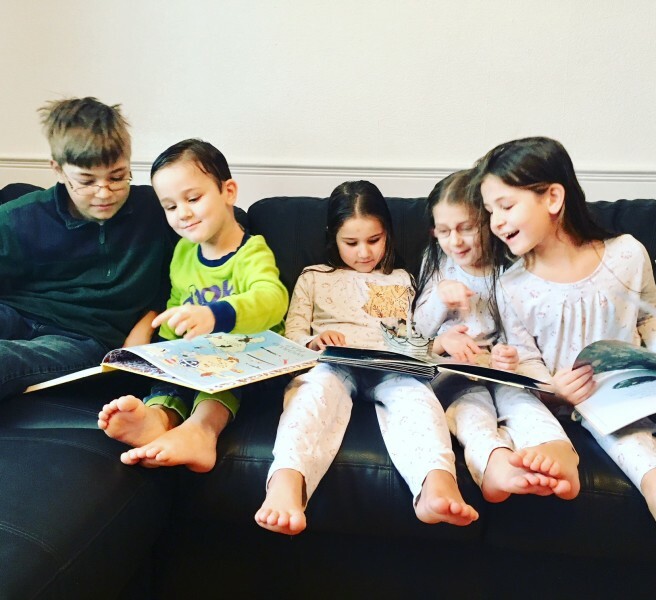 Stories are read through the day regardless, usually with everyone piled on the sofa or gathered together in the living room. Much as I would sometimes like to bring bedtimes forward and pack them back off to bed at 11am after a daytime bath, I suspect they would not oblige me enough to settle themselves down to sleep. Hell, they don’t oblige me to settle down to sleep when it is their bedtimes. Instead, they normally grace us with a safari experience, mimicking a herd of baby elephants as they stampede from bedroom to bathroom because their bladders inexplicably shrink to the point of needing to wee every 4 minutes and 32 seconds. This inconvenience is likely triggered by the other inexplicable phenomenon that only kicks in at bedtime: the constant and dire thirst that they suddenly suffer from, requiring several trips downstairs to get ‘one more drink.’ Increasingly puzzling to me is how this particular ailment is accompanied by the lack of ability to drink down water normally. There must be something about bedtime hours that strips them of their ability to gulp any liquids and to only be able to take the smallest, teeniest, barest of sips instead. Several times over. 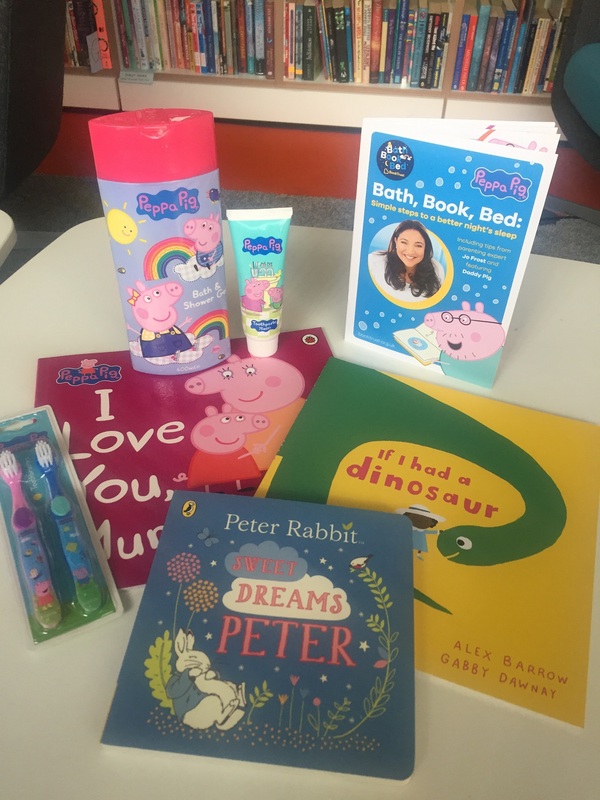 Win a Bath, Book, Bed Goody Bag! To enter to win just leave a short comment telling us your favourite childhood book and the memories it invokes that make it your favourite. You can also gain extra entries by sharing this competition on Facebook, tagging our Facebook page here in and linking back to this competition, and also by following us on Twitter, tweeting about this competition and linking back to this page. Leave an extra comment with the URL of your Twitter/Facebook post in the comment section below. The closing date of the competition is 30th April at midnight. UK entries only please. Do you need a debt consolidation loan when going for debt settlement options? I loved Enid Blyton books such as the Famous Five, and I would imagine that I was also going on an adventure. I can remember spending a whole school summer holiday ploughing through the full set of Enid Blyton’s Famous Five books that my cousin had given me. Winnie the Witch….started my fascination with witches! I loved the Enid Blyton books, they were a great adventure. I loved the Faraway Tree books by Enid Blyton as a child. They had the most colourful characters and creative stories that I adored. My favourite books were the Famous Five by Enid Blyton they were just amazing books they would take you into an world of fun and adventure and as a child I just loved it feeling part of their amazing adventures. I used to love all the Topsy and Tim books. I remember my dad reading them to me and my sister at bedtime. He used to try and skip a few pages… I was able to read anyway, but my sister knew the stories off by heart and told him off for missing pages! I loved The Tale of Georgie Grub, about a boy who refuses to get washed. I didn’t need anyone to read it to me in the end, I had it memorised. I can still remember parts of it now! My favourite was Enid Blytons books about The Magic Faraway Tree, they transported me into a world full of fascinating characters and adventures and made me feel that no matter my worries there was magic out there somewhere. Five minutes peace by Jill Murphy was one of many favourites. I now enjoy reading it to my son. My favourite book as a child was Matilda by Roald Dahl. I loved reading about a girl who loved to read – just like me. When I was very young I loved The Very Rainy Day, it was a charming story about a rabbit family getting all there wellies and umbrellas together to face the storms. It had lovely illustrations and I used to get my Mum to read it to me every night, it was a special time and I wish I had the book now for my little Grandson. Beatrix Potter books. My dad has a set from when he was a little boy and I grew up reading them. I love them so much, Pigling Bland, Mrs Tiggywinkle, Benjamin Bunny & Tom Kitten were the highlights of my childhood. When my own daughter was born my Dad got her a new edition of the same set of books and we read them together! I was an avid reader and still am. I remember my friend having an usbourne fairy tales book and I begged my mum to buy it for me. I remember reading it loads and searching for the duck on every page. I still have it and can’t wait until me daughters are old enough to enjoy it like I did. The Tale of Peter Rabbit was my favourite book, it was presented to me when I was about six as a reward for excelling with my reading. It does bring back happy memories of my childhood, little wooden desks and chairs, ink wells, climbing on the bars in the playground lunchtime and doing my times tables. The sixties was a time when school was basic but we were given good values, many of which are still with me now at the age of 61 years. Life goes on and I am now reading my favourite book to my little 2 year old grandson. Alice un Wonderland was my favourite book as a child, purely because it was the only hard back book i had. It still makes me feel so special when i see it on my shelf. I always thought this was my sisters favourite story as she always used to choose it for her bed time story as a child but I loved to lay & listen to it too. When I read it to my daughters it takes me right back to being a little girl myself, very comforting! Mine is a blue, hard-back copy of Charlie and the Chocolate Factory. My favourite book when I was tiny was moo, baa, la la la….our copy was so worn that it fell apart. My memory is that my whole family knew it by heart, even thirty odd years later! I had to buy a new copy for my daughter and she now loves it too. Matilda was one of my favourites, I was a book nerd too so it was great to read about another one. My niece is turning into a book work too, so it’s great, I get to share all my childhood books with her. I remember my cousin giving me the set of Faraway Tree books and I read them all day and well into the night. I loved the characters and still love these books. Swallows and Amazons – born in London the “countryside” was an unknown and wondrous world! My favourite book was The Very Hungry Caterpillar as we used to read it in infant school. The Tiger Who Came To Tea because I loved the story and illustrations. It brings back happy memories from school holidays and I challenged myself to read it in 2 days my mum was very proud. I have a little box full of Beatrix potter books, I used to love them when I was little, my mum would read one of them to me each night and now i read my little girl Heidi one each night too, We both love the Tale of Peter Rabbit, I used to be really good at imagining what the real Mr Mcgregor looked like I remember wondering if Peter would manage to grab some vegetables before Mr Mcgregor spied him. My daughter giggles when I read her the story when Peter is being naughty! I loved The Little Grey Rabbit series of books, love all the adventures and reminds me of the house I grew up in as my sister had Little Grey Rabbit wallpaper in her room. My favourite book was The Magic Faraway Tree by Enid Blyton. I must have read it about 50 times! I enjoyed rereading it to my own kids too. When I was little, my Nanna used to lay next to me in the dark and just told a story to me without a book! She would recite fairytales like the 3 little pigs, Goldilocks etc. What an amazing thing to do and you know what? I would actually lay there and listen and didn’t even question, not getting to look at pictures! Meg & Mog – I’ve always had black cats since! Ive never read a book that made me feel so magical as The Magic Faraway Tree by Enid Blyton. How I longed to visit that place! the three little pigs, lady bird edition. scared me witless but i kept coming back to it! My favourite books as a child were by Enid Blyton, I loved them all and remember reading them secretly when it was past bedtime and racing to switch off my light and get into bed as soon as I heard my mum or Dad on the stairs! My own children have inherited my love of reading too, I think theyve worked out if they’re reading quietly, I dont send them to bed as soon! The Three Billy Goats Gruff – I loved the repetitive phrases, different voices and the trip-trapping of the Billy Goats. I loved all the Roald Dahl books particularly the Twits which was very funny! I loved Matilda by Roald Dahl. My favourite books as a child were the secret seven and the famous five. Wish I still had these books but they were full of adventures and always wanted to do or go somewhere different. I’m still like that today, finding adventures. And teaching my girls to be the same. When I was really little we had a book called “Who’s Afraid?” which was a kind of counting, haunted castle book, which I loved. When I started reading for myself, I loved any Enid Blyton but particularly the Wishing Chair and Faraway Tree books. Ahhh, memories! Charlotte ‘s Web was my favourite book as a child. I would read it under my covers with a torch as I should have been asleep. I enjoyed all the Famous Five books by Enid Blyton and imagined myself as a fellow adventurer. I loved Carrie’s War by Nina Bawden and it evokes the memory of my mum reading to me before she went out for a meal, wearing her red velvet top & lipstick, and smelling of Chanel. I remember watching her lips moving as she read the words. I always used to love Brer Rabbit books by Enid Blyton. It always appealed to me how Brer Rabbit always managed to get the better of Brer Fox etc. It was so magical when mum read them to me and always makes me feel warm and loved every time I think back to that time. I loved Mister Meddles Mudle’s by Enid Blyton, brings back memories of all the laughing me and my sister had reading this book, such a fun story with fantastic illustrations. Love BFG by Roald Dahl. I liked the Faraway Tree books and the Narnia series, I also read all the Gillian Avery books which I first discovered when I decide to start at A in the little room of our library that housed the childrens books. I read H E Bates Darling Buds series long before the television series. I spent hours in the library and would read books there, no one ever said I should or shouldn’t be reading the books I chose. My favourite childhood book were Enid Blytons Faraway Tree series bug my favourite books to read to my children are We’re going on a bear hunt. The Harry Potter series because they became an escape from the bullying I was experiencing at the time and ultimately made me realise that being myself was ok. The Three Billy Goats Gruff was my all time favourite childhood book. I remember vivdly the illustrations and the feeling of dread followed by the happy ending. Classic triumph over evil lol. Alice in Wonderland, always loved it. I remember my auntie gave me the book. It was very old! The Jolly Postman- used to love opening the letters and reading them, especially as I never got any post myself. My favourite was the Guess How Much I Love You books. Brings back warm happy memories. Now I read them to my son who loves them as well.